Conceptual drawing of the superlattice in which spread electrons are confined to a narrow space to enhance thermoelectric conversion. “This is a significant step forward towards reducing the amount of heat wasted by power plants, factories, automobiles, computers, and even human bodies,” says Hiromichi Ohta of Hokkaido University. 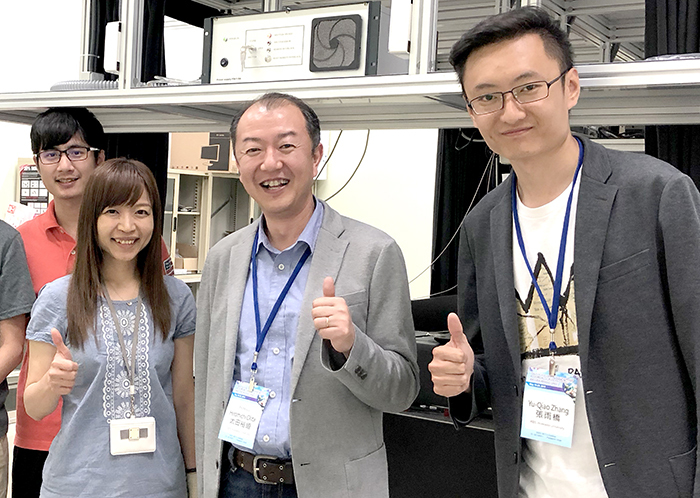 Professor Hiromichi Ohta (center) and Yuqiao Zhang (right) of Hokkaido University, and Assistant Professor Yu-Miin Sheu (left) and Cheng-Ping Chang (far-left) of National Chiao Tung University in Taiwan. Zhang Y. et al., Double thermoelectric power factor of a 2D electron system. Nature Communications, June 20, 2018. This research was supported by Grants-in-Aid for Scientific Research on Innovative Areas “Nano Informatics” (25106003, 25106005, and 25106007), Grants-in-Aid for Scientific Research A (17H01314) and B (26287064) from the Japan Society for the Promotion of Science (JSPS), and the grants from Taiwan Ministry of Science and Technology (MOST 104-2112-M-009-023-MY3 and MOST 104-2738-M-009-006).